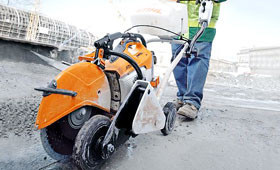 Browse the wide range of accessories available for all STIHL cut-off saws. The STIHL FW 20 cart is ideal for professional users who are required to deliver precise edges over long cuts. Water containers help to suppress dust when using a cut-off saw. For more information on all STIHL accessories, please contact your STIHL Approved Dealer.